Osteoporosis often causes very painful fractures, which can take many months to heal. In many cases, the pain starts to go away as the fracture heals. Most new fractures heal in approximately 3 months. Pain that continues after that is generally considered chronic pain. One cause of chronic pain is vertebral fractures. When a vertebra breaks, some people have no pain, while others have intense pain and muscle spasms that last long after the fracture has healed. Pain is the body’s way of responding to an injury. When a bone breaks, nerves send pain messages through the spinal cord to the brain, where they are interpreted. Your response to pain is determined by many factors, including your emotional outlook. For example, depression seems to increase pain perception and decrease abilities to cope with it. Often, treating the depression treats the pain as well. Whatever the cause of chronic pain, feelings of frustration, anger, and fear can make the pain more intense. Chronic pain can affect all areas of your life and should be taken seriously. If you have chronic pain and need help managing it, you may wish to discuss these coping strategies with your doctor. There are several options for osteoporosis-related pain management. Heat in the form of warm showers or hot packs, can relieve chronic pain or stiff muscles. Cold packs or ice packs provide pain relief by numbing the pain-sensing nerves in the affected area. Cold also helps reduce swelling and inflammation. Depending on which feels better, apply heat or cold for 15 to 20 minutes at a time to the area where you feel the pain. To protect your skin, place a towel between your skin and the source of the cold or heat. TENS units are small devices that send electrical impulses to certain parts of the body to block pain signals. Two electrodes are placed on the body where you are experiencing pain. The electrical current that is produced is very mild, but it can prevent pain messages from being transmitted to the brain. Pain relief can last for several hours. Some people may use a small, portable TENS unit that hooks onto a belt for more continuous relief. TENS units should only be used under the supervision of a physician or physical therapist. They can be purchased or rented from hospital supply or surgical supply houses; however, a prescription is necessary for insurance reimbursement. Spinal supports or braces reduce pain and inflammation by restricting movement. Following a vertebral fracture, a back brace or support will relieve pain and allow you to resume normal activities while the fracture heals. However, continuous use of a back support can weaken back muscles. For this reason, exercises to strengthen the muscles in the back should be started as soon as possible. Physical therapists can help you reorganize your home or work environment to avoid further injuries. Physical therapists also teach proper posture and exercises to strengthen the back and abdominal muscles without injuring a weakened spine. Water therapy in a pool, for example, can improve back muscle strength and reduce pain. Acupuncture is the use of special needles that are inserted into the body at certain points. These needles stimulate nerve endings and cause the brain to release endorphins. It may take several acupuncture sessions before the pain is relieved. Acupressure is direct pressure applied to areas that trigger pain. Acupressure can be self-administered after training with an instructor. Massage therapy can be a light, slow, circular motion with the fingertips or a deep, kneading motion that moves from the center of the body outward toward the fingers or toes. Massage relieves pain, relaxes stiff muscles, and smoothes out muscle knots by increasing the blood supply to the affected area and warming it. The person doing the massage uses oil or powder so that her or his hands slide smoothly over the skin. Massage can also include gentle pressure over the affected areas or hard pressure over trigger points in muscle knots. Note: Deep muscle massage should not be done near the spine if you have spinal osteoporosis. Light, circular massage with fingers or the palm of the hand is best in this case. Visual imagery involves concentrating on mental pictures of pleasant scenes or events or mentally repeating positive words or phrases to reduce pain. Tapes are also available to help you learn visual imagery skills. These forms of psychotherapy may be useful for those whose pain has not responded to physical methods. People who suffer from chronic pain often experience emotional stress and depression. Therapy can help you cope with these feelings, making it easier to manage your pain. Although these are probably the safest pain relievers available, they sometimes cause stomach irritation and bleeding. Various methods of pain management are used in many hospitals and clinics across the country. 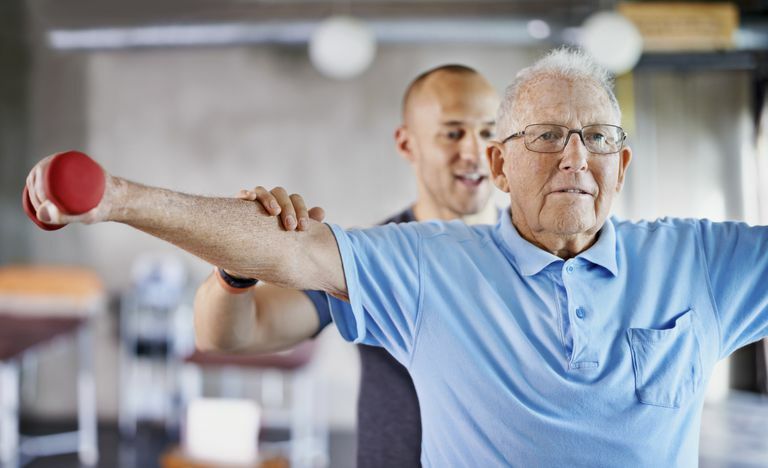 If you have chronic pain that has not responded to treatment, you should consult your physician for a referral to a physical therapist or a clinic specializing in pain management.